Here is the picture of the chip floor – www.epoxy.com/chips.aspx that that was about 15 years old when the picture was take. It is in a Vermont Interstate Rest area. It has never been waxed. You can still see the ceiling lights reflecting off the surface. Only maintenance has been to mop it. Holidays mean temperatures are getting colder in many parts of the country . Our company started out as an installation company in Vermont. Summers are very short and winters are very long in Vermont. To stay a viable company, we had to figure ways of working through the winter. Tenting and heating areas during the winter is time consuming and expensive. The solution is found in resin products that will set in low temperatures. The most durable and cost effective options of installation at cold temperatures is Epoxy and Methyl Methacrylate. Cold Temperature Cure Resins can also be used as a super-fast setting Resinous Mortar or Coating at normal temperatures. Our Cold Temperature Cure Resins used at normal temperature give you quick turnaround time for small jobs, or larger jobs that require a short turn-around time. Cold Temperature Cure Epoxy Resins allow installation to be done at low temperatures as low as 35°F., (although it sets a lot faster at 40°F) expanding your epoxy coating and epoxy flooring installation season. Epoxy.com Cold Temperature Cure Epoxy Resins can also be used in cold storage areas like food processing areas, where the temperature cannot be raised higher than 35° F or so. Normal cured epoxy typically requires 50°F or more. Depending on how you mix the aggregate into the products below, they can be used as a mortar for overlays, or a grout for sealing between other hardened construction materials. Product #1 Cold Temperature Cure Epoxy Coating is 100% solids and specially formulated coatings for cold temperature applications. Cold Temperature Epoxy Coating #1 is able to cure at temperatures as low as 35°F. It is has Zero (0) VOCs. Since it has no VOCs, it has no solvent so it meets the strictest possible standard for a low VOC coating. It is often used in coolers and food preparation areas that require constant low temperatures. Product #1 Cold Temperature Cure Epoxy Coating is also frequently used in room temperature applications to meet super-fast cure, limited shutdown needs. Product #10 Cold Temperature Curing Epoxy Mortar Resin – This product has a low modulus of elasticity (flexibility) and is Low Viscosity. The low viscosity allows heavy loading of the right fillers. The heavy filler loading helps not only to save money, but helps to maintain better thermal coefficient with respect to concrete and steel. The low modulus of elasticity prevents it from being brittle making it less vulnerable to thermal coefficient differences. It also gives it better impact resistance. You can find more information on cold temperature cured epoxy at: http://www.epoxy.com/EpoxyColdCured.aspx. Epoxy.com Product #100 Moisture Tolerant Primer and Base Coat is a unique two-component, moisture tolerant, extremely high density, chemically enhanced epoxy based product which reduces the passage of water vapor and moisture through slabs on, above or below grade, thus eliminating delamination and blistering of adhesives, floor coverings, resin floor systems, epoxy terrazzo and coatings. Epoxy.com Product #100 Moisture Tolerant Primer and Base Coat controls water vapor transmission levels for the installation of most floor covering systems, including VCT, sheet vinyl, carpets, wood, laminates, epoxy resin flooring and epoxy terrazzo. Can be placed on new concrete in as little as 5 days. Water based – low VOC. Compatible with most flooring systems – conventional, and seamless epoxy flooring systems. Does not support the growth of mold. Easy to install with little down time. Substrate must be free of dirt, sealers, waxes, and other foreign materials that would interfere with proper bonding. Must be installed a minimum of 1/8 for use with moisture sensitive floor coverings. Surface preparation is the most critical portion of any successful resinous flooring system application. All substrates must be properly prepared as outlined in Epoxy.com Surface Preparation Procedures. Epoxy.com Technical Support Department is pleased to answer any questions. Epoxy.com Product #100 Moisture Tolerant Primer and Base Coat is a two-component material. Do not alter mixing ratios in any way. Part I and Part II are supplied in the correct mixing ratios. Always mix a complete unit in the proportions supplied. Stir material for approximately 3-4 minutes to form a homogeneous consistency using a slow speed drill and “Jiffy” blade. Do not entrap excessive air. Scrape all sides and bottom of container to ensure thorough mixing. penetration. Apply with a squeegee and short nap roller to the properly prepared substrate. Back roll with the short nap roller to achieve a uniform coverage. Allow to cure hard enough for foot traffic, about 3-4 hours at 75 degrees F.
cover 30 sq. ft. @ 1/16″. Broadcast surface with broadcast sand to excess (30-50 lbs./100 sq. ft.) with Epoxy.com Product #77 to achieve 1/8 inch. Sweep and vacuum excess or loose sand after hardening (16-24 hours, depending on temperature). Apply top coatings or resin floor system directly over broadcast surface. Prime surface with appropriate Epoxy.com primer as required. For vinyl flooring and other floor coverings consult with manufacturer of floor covering. Mixing Ratio 1:4 by Vol. After completing the application of Epoxy.com Product #100 Moisture Tolerant Primer and Base Coat and the topcoats or floor covering system, the installer should provide the owner with maintenance instructions relevant to the specific topcoats or floor covering. If floors become slippery due to animal fats, oil, grease, or soap film, clean and rinse thoroughly. For more information please visit our website at http://www.Epoxy.com, email me at norm@epoxy.com or call Epoxy.com Technical Support Department at 352-533-2167. Here is an outline of the procedure for patching with Epoxy.com Product #1 and Product #10. Cold cure is identical but you should make even smaller batches and work even faster. Mix a small amount of the #10 (mix ratio 2A: 1B). Measure accurately and mix for 3 minutes with a proper size mixer. Typically very small batches less than a quart can be mixed with a stir stick. Larger batches should use a mixing paddle in a low speed drill or similar. Typically mixing paddles are 5 inches or more in diameter. 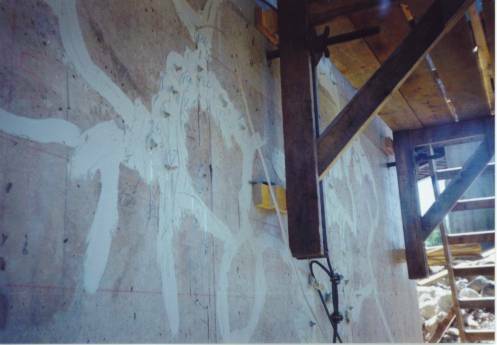 Apply a primer coat of #10 at a rate of 250-300 SF per gallon (typically done with a roller) to the substrate the mortar is to be attached to. Typically you will allow this to harden to the touch to make troweling into it easy. You can trowel into the wet primer in the case of small patches. Mix another small batch of #10, using the methods in step 1 above. Add Product #82 Mortar Blend Aggregate to the mixed resin in 3a. You can add as much as 50 to 75 lbs. of mortar blend aggregate to a gallon of mixed #10 resin. If the material appears to wet you can add more, if it is too dry add less. Quickly trowel the patch into place. Winter Cure Epoxy can set very fast in the bucket. After the patch in step 3 has hardened, you can grind off any high spots and fill more material again if needed. Then seal the top of the patch. Product #10 is thinner than the #1, making it an excellent sealer for sealing up the patch. Mix small batches of #1 using the methods used in #1 above. Mix optional Antiskid fine into the coating above at a rate of 8-16 volume ounces of Anti-skid per gallon of mixed resin. 12 ounces per gallon is typical. This is done by mixing the resin first, adding the anti-skid and mixing for another min. Quickly apply the material with a roller at a rate of 160-200 SF per gallon per coat. Two coats is recommended. Please read all the information below before starting your project. SDS Product #1A – All Purpose Coating Hardener Component MSDS. BE SURE TO CALL ME WITH ANY QUESTIONS OR CONCERNS! Epoxy.com Materials have nearly 40 years of history with their seamless flooring products. These high quality products seldom have to be repaired. There have been a few times with Epoxy.com Products where the floor has been damaged in a fire, or a piece of equipment has been moved exposing an area that had not been done before. Picture of a Terrazzo Floor patched with an accent color. The most difficult thing to do in repairing existing seamless floor is matching the color. The solution to this problem is a simple one: don’t try to match it, try to accent it. Do this in a way that it looks like it is part of a design. This adds aesthetic appeal while creating an easy solution to the color matching issue. Are you going to add additional seamless flooring next to the flooring to be patched? If so use the accent color for the new area of flooring. That helps to tie all the colors back together. For a complete list of seamless flooring epoxies please visit – www.epoxy.com. You can also email us, or call Epoxy.com Technical Support Department at 352-533-2167. The following article is written with enough information about resin injection systems to help protect the Owner from the misuse or improper installation of an injection systems. For more information contact me: Norm Lambert. This is the second in a series on Infrastructure Repairs Using Epoxy. Part One was Introduction to Epoxy Injection. If your have not read that yet you may want to go back and read it before you proceed with reading this. As with all repair and rehabilitation of concrete, the initial job analysis is by far the most important step. Epoxy Injection Resin will weld concrete cracks but, of course, will not repair the cause of the cracking. Analyze each potential injection application to determine the exact cause or causes of the cracking. Correcting the cracking problem can be fairly simple, or may be difficult involving design changes. Consult a structural engineer when design changes are necessary. Do this before starting the injection. Repairing cracks by Injection is effective after these design changes. Prevent future cracks by fixing the original cause of the cracking, when ever possible. Parking garages are an example of cracking problem that require a structural engineering analysis. Often inadequate design for expansion/contraction is the cause for parking garage structural cracking. Avoid weld injecting a crack if there are not enough expansion joints. Sometimes flexible overlays such as Epoxy.com System # 495 can be used to overcome this defect. This does not however encapsulate the rebar in a way that will totally stop the premature deterioration of the steel. Often times additional joints are needed, thus the analysis of cracking problems is critical. Bridge decks and slab on grades can often be repaired with Epoxy.com Product #684LV crack healer and sealer and save some of the cost of doing epoxy injection. For more information visit our website at http://www.epoxy.com, email us at info@epoxy.com or call our technical service department at +1 (352) 533-2167. One of the most versatile, problem solving products available in epoxy systems today is Epoxy Injection Resin. Structural restoration of concrete by epoxy injection is very often the only alternative to complete replacement. It therefore results in large cost savings. Injection protects the rebar and stops water leakage. 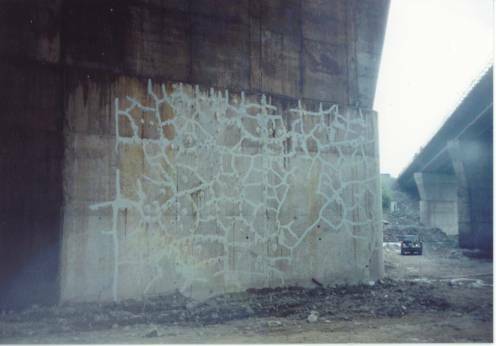 Epoxy injection of concrete cracks has been used for decades. When properly installed it is still working as well as it did right after it was installed. Epoxy Injection Resin is a system for welding cracks back together. This welding restores the original strength and loading originally designed into the concrete. 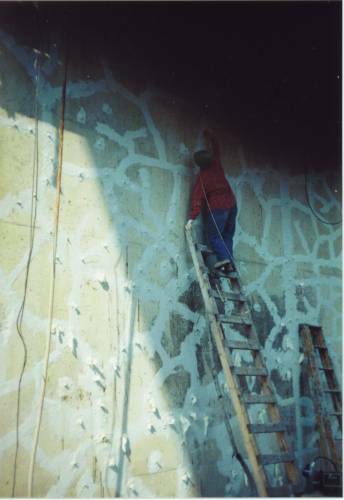 Epoxy injection restores the structural qualities the concrete design intended. In other words under most conditions it makes the concrete as good as new. It creates an impervious seal to air, water, chemicals, debris, and other contamination. Other waterproofing injection systems like urethane resin will seal the crack from water but will not repair the the member structurally. That makes the structure member vulnerable to additional structural decay. This structural advantage that an epoxy injection repair gives, makes it the best choice for most situations. Epoxy or Urethane Injection discusses when to use epoxy and when to use urethane. A crack, obviously, is a sign of failure caused by stresses, inadequate design, improper curing, etc. One of the dangers of a structural crack is the effect that it has on the reinforcing bar. The reinforcing represents one of the main structural values of the concrete. Cracks left unprepared allow moisture, road salts and other contaminants to penetrate and attack the rebar. The rebar deteriorates, losing the structu ral value. Loosing the entire structure is often the result. Epoxy injection resin has two purposes. First, it effectively seals the crack to prevent the damaging moisture entry. Secondly, it monolithically welds the structure together. Most people assume that this welding of the structure is the most important result of the repair. Actually what is most important is the sealing. The sealing properties of the injection prevents premature deterioration of the reinforcing. This can be of equal, or in some cases greater importance than the structural welding. It would theoretically always be desirable to get this welding effect.